Congratulations to CSW Kenosha employee, Josh Tritten, named a Refrigiwear Warehouseman of the Year! Josh’s outstanding work ethic and great attitude led to his selection from hundreds of competitors nationwide. 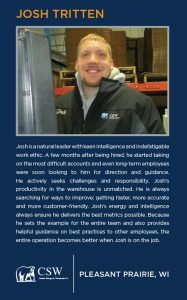 In addition to receiving Refrigiwear swag and a commemorative plaque, Josh is featured in the 2018 Refrigiwear calendar.